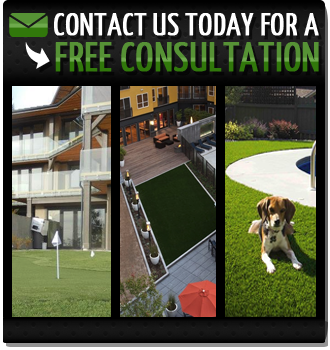 We’ve noticed residents of Vancouver using artificial grass products from SYNLawn® in the most creative of ways. While our synthetic turf has long been a favorite for synthetic lawns, putting greens and more, a growing number of our residential and commercial customers are using our artificial landscaping turf as their surface of choice for rooftops, decks and patios, among other settings. When you think about this it makes perfect sense, as synthetic grass makes a comfortable and appealing surface on which to relax and entertain. Here at SYNLawn®, we are excited that Vancouver residents, and indeed residents all over Canada, are discovering new and exciting ideas as it pertains to synthetic turf installations. The concept of adding the most natural looking synthetic grass in the industry to urban landscapes and city dwellings is one whose time has come. SYNLawn® synthetic turf is so versatile that the only limit to how and where it can be used is your imagination. Whether you live in the heart of a big city or in a suburb, or are a homeowner or business owner, SYNLawn® can help you to bring beauty to any outdoor space. How will you use SYNLawn synthetic turf? Let’s discuss your custom installation today! We are happy to give you a free consultation, discuss the perfect alternative for your needs so you can relax more and enjoy the outdoors.